box was damaged, but product still in good condition and fully operational! Very happy with item! Arrived safe in well packed box. Good Seller! Fast Shipping! Item exactly as described! Works perfectly. Shipped quickly. Good seller! The seller does not respond to messages when an item is defective. Bad seller. Best mid range cpu for the price. 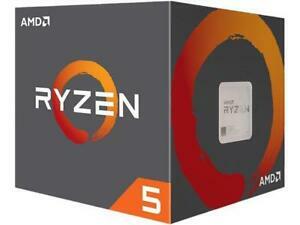 Excellent middle of the road cpu, with excellent pricing and includes cpu cooling unit. AWESOME 6c-12t with SMT enabled! If you're looking for a detailed, technical review, sorry. I got this as one of the parts for my son's first build. He's a teenage gamer and managed to figure out how to install with no problems. He hasn't come out of his room in days and when I go to check on him all I get is a glazed look and comments about it being a beast. I'm guessing it's good. Games and apps run a little better than my 1600. Overclock is a little better too. Love this thing.